I found this darling little basket on SCS and followed it to her blog for directions. It was so easy as Lynn gives great directions! It measures 2 1/2" x 2 1/2"...perfect for a tiny baggie of chocolates. Not really sure what is up with my lighting...maybe it's our latest snow storm?? My downline Danee is at it again! She just sent these newest punch art nugget holders to me to share with you. I updated her last bunch of animals with the punches she used if you care to look back. Take a look at this stationary box! It was made by Felicity Gray of Melbourne Australia. great job on the little box, I love your creations and blog. those animals are so cute! 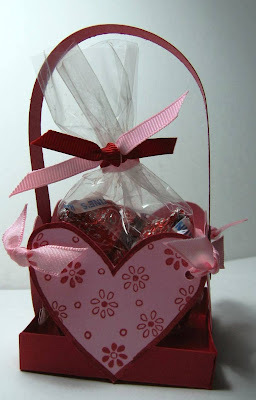 I love your Valentines/heart box/bag too! that is such a cute idea! TFS! have a wonderful Friday! How inventive of you!!! SOOOO CUTE! Aaaackkk, the link won't work. Love your blog, I read every post using Google Reader. Please repost the link to Felicity! Hello there! I'm leaving a comment for two reasons...first to tell you I have been reading your blog daily since I found it, and second to tell you that I have tagged you with a Kreativ Blogger Award on my blog! I love your stuff! Thanks for posting your awesome works! Fun stuff! I saved this off of SCS too! I must go try one now...enjoyed all the punch are too! great projects becky. 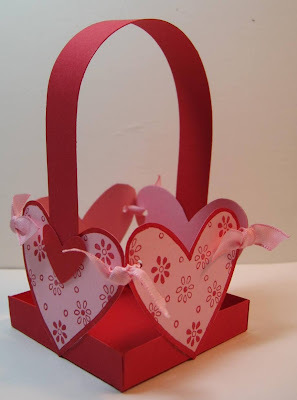 the valentine box is adorable! Hi, Becky! We have never met but I actually visit your blog regularly and wanted to pass forward a special award that was given to me. Hope you don't mind! Your creativity never ceases to amaze me! When I come to your blog not only do I see all your beautiful creations BUT I always leave with great inspiration. Thanks for sharing all your great cards and projects. I can't wait to see what you come up with next. the heart box is super cute and i LOVE the animal nugget holders! Thank you so much for the compliment and link on the heart basket, yours is adorable! The punch art nuggets are so fun clever and your stationary box is beautiful!